Extraordinary Dogs: Cyclists asked to exercise caution around Guide Dogs! Cyclists asked to exercise caution around Guide Dogs! A charity for blind people has said guide dog owners are scared of going out in London because of cyclists. The Guide Dogs for the Blind Association said it had seen more reports from guide dog owners who had been hit by a cyclist or come close to a collision. Rob Harris from the group said some visually impaired people were "fearful" about going out which was "worrying". The London Cycling Campaign said every cyclist had a "duty of care". Mr Harris said: "We work incredibly hard to get blind or partially sighted people out of their homes and mobile, so to hear that vision impaired people are anxious and in some cases fearful about going out in London because of irresponsible cyclists is very worrying." In a survey conducted by the association, of 33 guide dog owners in London who responded, 14 said they had been involved in a collision and 25 said they had been involved in a "near miss" with cyclists on pavements or jumping red lights. A further five blind people without guide dogs said they had been in collisions with cyclists - out of 16 who responded to the survey. There are 41,060 people registered blind or partially sighted in London with just over 320 using guide dogs in the city. Charlie Lloyd, from the London Cycling Campaign, said: "Any crash or a close pass which frightens or intimidates a pedestrian is unacceptable. Far worse when that person is blind, partially sighted or in any way less able than we are." Guide dog owner Deborah Persaud said she was involved in a collision with a cyclist on the pavement while she was walking home in Islington. She said: "My dress was torn, the contents of my handbag damaged and I was left with damage to my shoulder and hip." 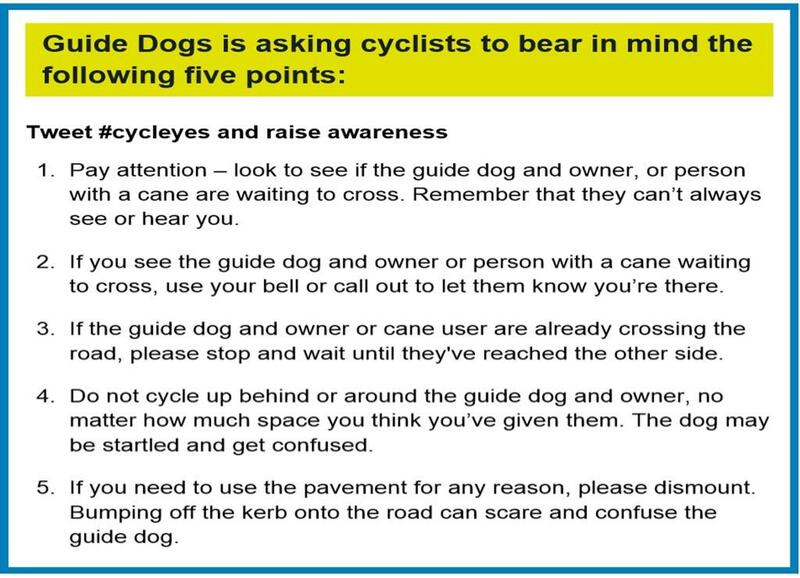 As part of the campaign, Guide Dogs said it was reminding riders to use a bell or call out to owners waiting to cross the road to let them know they were on the road and to remind cyclists not to ride up behind a guide dog in case it startled them. cycling is very good for loosing weight we have recently studied the best spining bikes.